The Pikmin series was one of those bold moves by Nintendo that seemed to be going in a different direction than anything else in the gaming industry. It didn’t pay off quite as successfully as the herd-defiant Brain Age, Wii or Nintendo Switch, to name three of the company’s more radical creations, but it did at least result in a very good game series. The first Pikmin game came out in 2001 on GameCube at a time of seeming victory for the darker, grittier aesthetic of hit PlayStation-centric series such as Resident Evil and Metal Gear Solid. The colorful and largely cheerful adventure of a miniature spaceman and his even tinier herd of monochromatic little plant-people in a battle against a garden full of cute bugs arrived in America in December 2001. It was released just after two grimmer epochal releases on rival platforms: October’s Grand Theft Auto III on PlayStation 2 and November’s Halo on Xbox. Those were the cool games. In theory and in reputation, Pikmin was not. The Pikmin game was a demonstration of the timeless strength of Nintendo game design. Pikmin 1 came out at a time… when you weren’t seeing a lot of games with a lot of bright red, yellow and blue. It was a time for much grittier-looking video games and there was a lot of questioning about whether Nintendo’s aesthetic really was still the thing people were interested in. Nintendo ... was always in some sort of branding feud with Sega or PlayStation for seeming to be too juvenile, and then you had this very colorful game in Pikmin show up, a new creation from Nintendo, them still not going dark and gritty... and yet, red, blue and yellow made sense as a gameplay system: red Pikmin, invulnerable to fire; blue Pikmin, invulnerable to water or incapable of drowning; yellow Pikmin [invulnerable to] electricity and they could jump better .... You were looking to harvest them and what would you see in this otherwise quote, unquote photorealist environment but red pellets, yellow pellets, blue pellets, these bright colorful things with big numbers on them? This isn’t the kind of design that anybody else was aspiring to do at the time. It’s almost like pre-school or Playskool or whatever school you want to use to describe the design, if you think about [whether] “Is it ‘macho’ enough? Is it ‘cool’ enough?” But if you think about it from a clarity of visual design and gameplay intent and ability for the player to parse the game design, it’s wonderful. Oh! A pellet with a 10 and it’s red? Ten Pikmin! Throw 10 Pikmin at it and they’ll carry it back like ants carrying an elephant. They’ll bring it over to the little onion bud spaceship, and they’ll turn that into 10 or more Pikmin sprouting from that, right? And knowing that feedback mechanism of how all that stuff would work was great. A big red pellet with a number 10, as seen in Pikmin 3, epitomizes the series creators’ confidence in easily-legible color-coded game design. It’s a style that was anything but in fashion when the series was born. The Pikmin games have never been huge hits, but they’ve been reliably well-made, fun adventures that build on the color-coded design of the original 2001 entry. I was on Ben’s podcast to talk about my favorite Pikmin game, which is 2004’s Pikmin 2. Some design tweaks from the first, including a removal of the first game’s timer and the introduction of tough caverns in which you couldn’t grow more Pikmin before completing them, elevated it to the top of my rankings. It also helped that Pikmin 2’s Piklopedia stands out as one of the best, funniest examples of Nintendo’s excellence in, of all things, lore-writing. Ben explains the history of the Pikmin series on the half-hour podcast, which I recommend listening to. 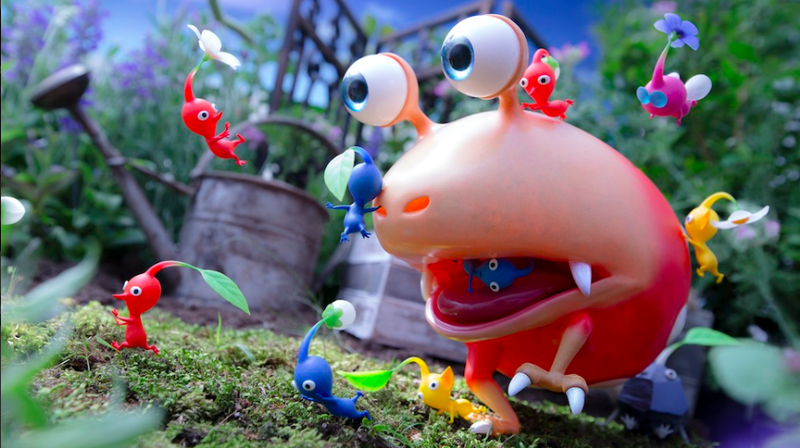 He optimistically predicts that a new Pikmin game will be out soon. I hope he’s right, but given the nine-year gap between the last two traditional Pikmin games, I’m not so sure that the current six-year wait is all the time that’ll be needed before a Pikmin 4 finally sprouts. While everyone is waiting, you can listen to other episodes of Challenger Approaching, which have featured other guests collaborating with Ben to talk about the history and highlights of Duck Hunt, F-Zero, Animal Crossing and more. You can find the podcast on iTunes, Google Play, Spotify and Stitcher.